Precious money has been arriving via PayPal and Canada Post in amounts of $25, $30, $50, and $100. This allows us to shrink back from the brink but we desperately need more to survive. We have to scan the world to bring you the truth of events and ideas that are developing in rapid succession. It takes 100 hours a week to get True North Perspective to your email box. We're being read in up to 121 countries. Your money buys us time. Please give us whatever you can afford. We need you now. Below we repeat two brief Editor's Notes. One justifies our claim that True North Perspective publishes in the best traditions of Canadian journalism and the second why it's vital that we receive financial support from our readers. Finally, a story you won't find in the corporate news: WikiLeaks exposes Washington's close ties to Gaddafi. Without further ado, we'll leave you with them. — Looking forward, Carl Dow, Editor and Publisher, True North Persepective. It has been said . . .
What's radical, in a pejorative sense, is that there is no longer a competitive press in Canada. Canada grew up with a competitive press. During the American Civil War The Montreal Gazette was pro South and pro slavery. The Toronto Globe was pro North and anti-slavery. In Canada's capital up until the 1950s the two English language dailies registered their differences on their front pages. The Ottawa Journal proudly proclaimed its allegiance with the word Conservative right up there with the newspaper's flag. The Ottawa Citizen matched this with the word Liberal. Late 1970s and into the 1980s bean counters became an assassination squad and killed daily newspapers throughout the country. — 362 words. Effective tomorrow, Saturday 13 August, due to financial constraints, True North Perspective is taking an enforced summer holiday during which we'll do our best to inspire readers to send pennies, nickels, dimes, quarters, and mucho-mucho loonies. We operate at a severe financial deficit and have, from time to time, seriously considered abandoning our determination to bring you honest news and honest analysis of what's behind the news. However, we'll take a deep breath during the next three weeks and take one more proverbial kick at the can by resuming publication Friday 9 September. We are dedicated to the success of True North Perspective because we believe that an accurately informed people are a free people. All of us at True North Perspective have ambitions aside from this project and would be immediately and happily otherwise occupied should we have to, albeit most reluctantly, bury True North Perspective. We know we can't succeed in publishing True North Perspective without you. We desperately need your financial support to "Keep Carry On" as a great man once said. — 630 words. 27 August 2011 — US embassy cables released by WikiLeaks on Wednesday, August 24, and Thursday, August 25, expose the close collaboration between the US government, top American politicians and Muammar Gaddafi, who Washington now insists must be hunted down and murdered. 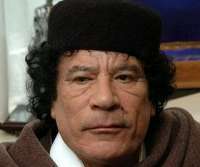 In the meeting held just two years ago, however, McCain took the lead in currying favor with the Gaddafis. According to the embassy cable, he “assured” them that “the United States wanted to provide Libya with the equipment it needs for its security” and “pledged to see what he could do to move things forward in Congress.” — 1,368 words.